I completed my studies at the Medical University in Białystok in 2013. Currently, I am doing my specialisation in paediatric dentistry and therefore I participate in training courses to broaden my knowledge in this area (the last one I participated in was about post-injury damage to teeth and facial part of the skull in children and adolescents, diseases of the periodontium and oral mucosa in children and adolescents, health education and promotion of oral health in children, adolescents and pregnant women, oncology of the oral cavity and the facial part of the skull at developmental age). I am a member of the Polish Society of Paediatric Dentistry and a regular participant in conferences organised by this Society. 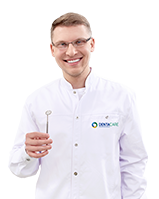 I perform procedures in the field of preventive dentistry, children’s dentistry, conservative dentistry and endodontics. At my leisure, I am fond of reading books, swimming, and playing board games with my friends. MicroJUMP – the fundamentals of microscope-controlled dentistry. The endodontic range of cases. All the shades of root canal treatment in practice. Presenting your own cases. Theory only in practice. Endodontic treatment or extraction?